This piece originally appeared in the Care issue of Perspectives (Vol.13, N.2, Fall 2012). Perspectives is available from AK Press here. The Community Acupuncture movement began over ten years ago and now includes a couple hundred clinics across the US. Community Acupuncture seeks to address class inequalities in health care by making acupuncture available to working class and poor people who cannot otherwise afford health care. Clinics typically charge a sliding scale of between $15 and $35 for a treatment, the equivalent of a co-pay if one is fortunate enough to have health insurance. Clinical studies have shown acupuncture to be effective in treating a wide variety of health issues, from chronic allergies, to stress and anxiety, to back and neck pain, to name a few. It can address both chronic nagging problems, and acute conditions. It’s effective in resolving any problem short of broken bones or cancer, and in those cases it serves as an excellent complement to Western medicine. In China, acupuncture and herbs are established parts of the health care system, with entire hospitals dedicated to these practices. Those suffering from cancer, for instance, will receive both chemotherapy and herbal IVs to help offset the negative effects of chemo and assist the patient’s immune system. China has socialized medicine, so an acupuncture treatment costs the equivalent of a couple of dollars. This is in stark contrast with the $65-125 price tag some “boutique” acupuncturists charge in the US, a cost that is well beyond the means of most working class or poor people. Somehow when acupuncture started developing in the US in the 1970s, it adopted a model of massage therapy, done in a private room, at a high cost. 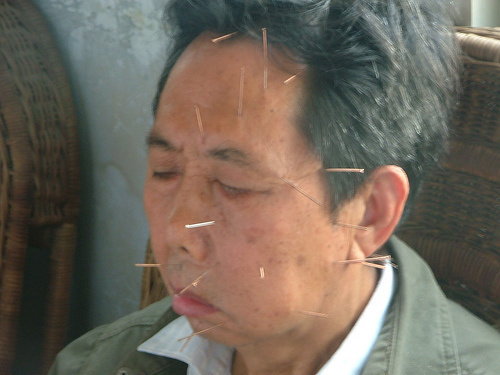 This is not how acupuncture is generally practiced in China. To be effective, one must receive acupuncture regularly, especially when confronting an acute health problem. In China, a patient is given a treatment plan at their first visit, which is a prescription for how often they should come back in order to resolve their problem. At a typical acupuncture clinic in the US, to receive the number of treatments to be effective, the cost would be very high. For instance, if one is suffering from a cold, or severe back pain, a practitioner of Chinese medicine might want a patient to come back for treatments four times in the next week. The practitioner might prescribe herbs and massage in addition to acupuncture. At traditional rates this could cost several hundred dollars. But at a Community Acupuncture clinic the cost would be a small fraction of this. This type of regular treatment is what is really going to be most effective in helping the patient recover. The use of acupuncture and herbs goes back thousands of years in China. It developed through trial and error, with theories being tested in practice, and what works being incorporated into the canon. In addition to the use of needles, herbs can address a wide variety of problems and are the second pillar of medicine in China, alongside other modalities, such as massage (Tui Na), cupping, gua sha (a friction technique using the back of a spoon that helps bring blood and qi to the surface of the skin, relieving stagnation), seven star needling (in which the skin is peppered with shallow, rapid pin pricks, also used to relieve stagnation), and other approaches. The practice of medicine in China was for generations closely associated with the philosophy of Daoism (Taoism). But that changed starting with the Chinese Revolution, particularly during the Cultural Revolution, which included savage attacks on Daoist monasteries and temples, and a widespread suppression of both Buddhism and Daoism. While attacking these Chinese traditions, at the same time, Mao saw the shortage of Western trained doctors and the existence of an indigenous form of medicine in acupuncture. Mao decided to promote acupuncture and herbs, but stripped the practice of its philosophical bearings. Consistent with his materialist interpretation of Marx and his favoring of practice, Mao applied scientific rationalism in codifing those aspects of Chinese medicine that conform to a Western scientific sensibility. He called this new system “Traditional Chinese Medicine,” or TCM, although this is ironic as it is actually more modern than traditional. It is TCM that has been exported to the West, and it is what is taught in the vast majority of Chinese Medicine schools throughout the US. To practice acupuncture in the US, one must pass a comprehensive licensing exam that tests one’s mastery of the theories and practices of TCM. 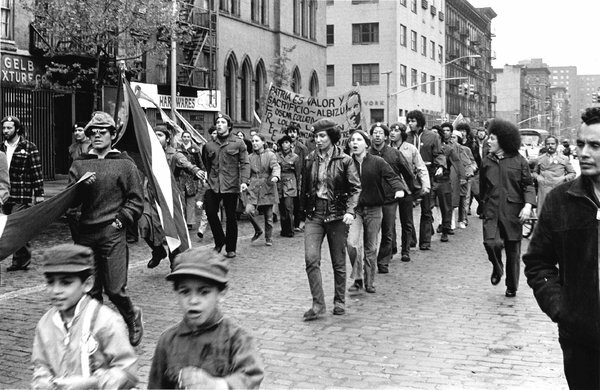 In 1970, the Black Panther Party and the Young Lords took over Lincoln Hospital in the Bronx in response to inadequate medical care offered to the community. One concrete result of the Panthers and Young Lords Lincoln Hospital takeover was the institutionalization there of an acupuncture detox center. This center became the model for others around the country. This was one of the earliest developments of acupuncture in the US, running parallel to its development as a more exclusive health practice. Whereas detox acupuncture served a mostly lumpen population, houseless folks or the marginally employed struggling with drug and alcohol addiction, the other form of acupuncture was developing as a kind of boutique acupuncture, and was available only to those who could afford it. Detoxing off of heroin, alcohol, or other substances involves a comprehensive approach, including using a set of acupuncture points located on the ears called the 5 Needle Protocol, or 5NP. This is the procedure used in street level detox programs throughout the US, and it is what was demanded by the Panthers and the Young Lords be instituted at Lincoln Hospital. Patients receiving 5NP are treated in a group setting, often taking out their own needles when they feel they are done. Detox centers are frequently funded by grant money or government subsidies, and offer acupuncture at little or no cost. These types of programs are becoming rarer these days, with increasing austerity being imposed on the population, resulting in social spending cuts. It was this acupuncture detox treatment model which inspired the development of group treatments, which in turn was institutionalized in Community Acupuncture. Group treatments allow acupuncturists to treat more people, thus allowing for charging a lower fee. People come in for a treatment, sit in a folding chair or recliner, or lie on a table, and are attended by one of the acupuncturists on duty. Patients are together in a large communal space, rather than isolated in individual treatment rooms. An acupuncturist can treat up to six patients per hour this way. Up until recently, the majority of acupuncturists in the West have marketed acupuncture as a mysterious and somehow magical experience, meant to be elevated into a sacred, special time which will cost you some serious money to enjoy. They appealed to Americans’ individualism and sense of entitlement by making the experience something which lasts an hour in a private room, with its exclusivity indicated by its cost. In part this reality is driven by the harsh debt most students of Chinese medicine incur just to get through the three or four years of a Master’s Program which is required to practice Chinese medicine in the US. To support themselves, and perhaps their families, while paying back tens of thousands of dollars in outstanding loans, often necessitates charging high fees and also prevents acupuncturists from serving underserved and marginal populations who can’t pay for their services. During the year I spent in Chengdu, China I had the opportunity to observe how acupuncture is practiced in a major TCM Hospital, and it looks nothing like what goes on in the US. The Chinese acupuncture clinics I saw were like a New York subway, with dozens of people in a room, sitting in whicker chairs, getting their needles. People socialize, or sit quietly. Acupuncturists busily move about the room, taking pulses, looking at tongues, making diagnoses, developing treatment plans, and inserting needles. It is busy and hectic, and often loud and profoundly matter of fact. It is no big deal. It is medicine. It is healthcare. It is getting better. It is not a private experience done to soothing music in a dimly lit room at the cost of a nice meal out. It is essential that as we build alternative health institutions, we make sure they are democratic expressions of our values, otherwise all the talk of “the People” becomes more of a marketing tactic than a genuine expression of a viable alternative. The movements of the 1960s and 70s, resulting in actions such as the takeover of Lincoln Hospital and the Panthers’ People’s Free Medical Health Clinics, were all about empowering everyday people. Both those being served, and those doing the serving, need to feel respected and empowered for the Community Acupuncture movement to reach its full potential. What we do is important, but how we do it is as important. It is essential that as Community Acupuncture clinics serve poor and working class people, that they also treat the people that work there with respect and dignity. A national organization for promoting Community Acupuncture was formed out of the older Community Acupuncture Network, called the People’s Organization for Community Acupuncture (POCA). Hopefully the hundreds of clinics that are part of POCA will ensure democratic workplaces, with empowered acupuncturists and other clinic workers like receptionists. The Community Acupuncture movement has the potential to address class inequalities in health care in the United States. By providing low-cost health care, people who would not otherwise be able to get care can. Also, by emphasizing preventative care, many health problems can be avoided. With an affordable sliding scale, people can get the kind of care they need, as often as they need it. With the spread of Community Acupuncture clinics across the country, people will have real possibilities to take care of themselves. In addition, Community Acupuncture clinics, at their best, offer a sense of community. Many of them have community bulletin boards where upcoming events and other low-cost services are announced. They provide a place where people care about you, helping overcome the alienation of modern life. And they can assist you in living life in a meaningful, healthy fashion. When you are run down from work, or burnt out on organizing, a Community Acupuncture clinic can help you restore yourself. They can assist us in the long struggle to fundamentally remake society, while modeling the type of socially just institutions that will be necessary to overcome the degradation of a capitalist economy, which cares more about short-term profit than the health and vitality of us all. By creating democratic workplaces they are overcoming the alienation inherent in traditional boss-worker places of employment while extending good health to a broad crosssection of the community. Paul Messersmith-Glavin is a community acupuncturist living and working in Portland, Oregon. 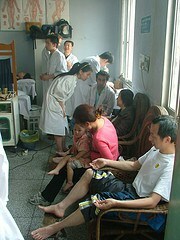 You can read his blog from China about how acupuncture is practiced there here! One of the flagship clinics of the Community Acupuncture movement has a reputation for mistreating the acupuncturists that work there and utilizing authoritarian and arbitrary rule. The local Industrial Workers of the World (IWW) chapter was involved in supporting unjustly fired workers, pointing out the serious nature of these concerns.